Food envy is real and it starts early. For me, it started in primary school. Looking back, I am not sure what I thought I was missing but whenever I caught a glance of the contents of my classmate Victoria’s lunchbox, I was green with envy. Instead of sandwiches made with thick slices of wholemeal sourdough bread, her sandwiches were made with white bread rolls, a once in a while weekend treat at our house. In place of the small Cox apples my mum picked up at the weekly apple stand just around the corner from our paediatrician’s office, Victoria’s lunchbox had candy bars. For Victoria, lunch was washed down with Capri sun orange juice instead of my homemade ice tea (half fruit tea, half apple juice). At my primary school swapping lunch boxes wasn’t really a thing, but I certainly came very close to considering it when Victoria brought in a sandwich that took my food envy to a whole new level: a sandwich stuffed with a Schaumkuss (the German equivalent of a mallomar, where the digestive base is replaced with a thin round waffle). And Schaumkuesse just happened to be one of my favourite treats then (I once ate 9 in a row without feeling sick). In fact, they still are. I love the mixture of different textures and flavours, the waffle base, the pillowy sweet marshmallow fluff and the thin layer of dark chocolate. And I can’t be alone with this given the sheer variety of marshmallow or marshmallow fluff based treats you can find in the sweets aisles of grocery stores across the world, whether it be mallomars, teacakes, the German Schaumkuesse of my childhood, Wagon Wheels etc. I had been meaning to play with the various elements to turn this childhood favourite into something a little different and that is how this recipe came about. Miso has been making its way into more and more sweet dishes in my house. Mixed with cream for a salted toffee sauce. To fill homemade rolos. Into white chocolate blondies. Hot chocolate. A miso apple pie filling is next on the list. Here, some sweet white miso makes its way into the homemade marshmallow fluff, giving it a little edge and taming its sweetness slightly. The waffle base of the Schaumkuesse of my childhood is replaced with a graham cracker base, much like for a mallomar or teacakes. However, to complement the miso marshmallow fluff, the graham cracker gets a little make-over as well. Brown rice flour, buckwheat flour and a small amount of kinako create a hearty and crumbly shortbread with toasted cereal notes and that provides the perfect base for a dollop of marshmallow fluff and a lick of dark chocolate (and that just happens to be gluten-free, in case that matters to you). Notes: The possible variations for these teacakes are endless, you could use milk or white chocolate to cover the marshmallow fluff, you could flavour the marshmallow fluff with a fruit curd like passionfruit, you could place a dollop of jam or dulce de leche on each graham cracker before topping it with the marshmallow fluff etc. The one recommendation is to make sure you spoon or pour the chocolate topping over the marshmallow fluff. I tried to be smart when I first made these and tried dipping the teacakes head first into the melted chocolate, only to realise that the marshmallow fluff started melting. So don’t do that. Start by making the Graham Grackers. Add the brown rice flour, the buckwheat flour, the kinako, the sugar, the light brown sugar, the baking soda and the salt to the bowl of a food processor and pulse a few times just to combine. Add the cubed butter and pulse until the mixture is sandy. Next, pour in the maple syrup and, again, pulse to combine. Add the milk, one tablespoon at the time, until everything comes together into a soft dough. Turn out onto a piece of cling film, shape into a rough ball, wrap the dough in the cling film, flatten it into a disk and place in the fridge for at least 2 hours to firm up. Pre-heat the oven to 175 degrees Celsius and a line a sheet pan with parchment paper. Place the dough between two pieces of parchment paper the size of a sheet pan and roll out until the dough is ca. 3 mm thick. If the dough feels too soft, place in the fridge or freezer to firm up before cutting out the crackers. Cut out circles the size of a digestive biscuit (or any other shape) and lay on the prepared sheet pan. The cookies won’t spread much so you can place them fairly close to another. Continue until all the dough has been used up (you may have to reroll the dough – if so, make sure the dough is placed in the fridge to firm up again before you do so). While you wait to finish cutting the cookies, place the sheet pan with those already cut in the fridge. Bake for 15-20 minutes until puffed up slightly and crisp on the outside. Place on a wire rack to cool. While the cookies are baking, prepare the marshmallow fluff. Place the egg whites, the sugar and the white miso in a large bowl sitting in a pan of simmering water (making sure that the bowl does not touch the water). Whisking constantly, heat the egg white, sugar and miso mixture until the sugar is melted and the mixture is opaque (this should take ca. 10-15 minutes). Remove the bowl from the pan. Using an electric whisk, beat the egg white mixture until it turns white and fluffy and can hold its shape (this will take ca. 5 minutes). Transfer to a piping bag and pipe tablespoon sized blobs on each graham cracker. Leave to set for 30 minutes. In a small bowl set in a pan of simmering water melt half the chopped chocolate. Once melted, remove the bowl from the pan and add the remaining half of the chopped chocolate. Once the chocolate is completely melted spoon a couple of teaspoons of melted chocolate over each graham cracker, ensuring that the marshmallow fluff is completely covered with the chocolate. Set aside for the chocolate to harden. The teacakes will keep for a couple of days but will taste best on the day they are made when the marshmallow fluff will be the fluffiest and the graham cracker base will be nice and crunchy. Thank you! I’d love to do that some day (even though it sounds like incredibly hard work). Thank you Kathryn! 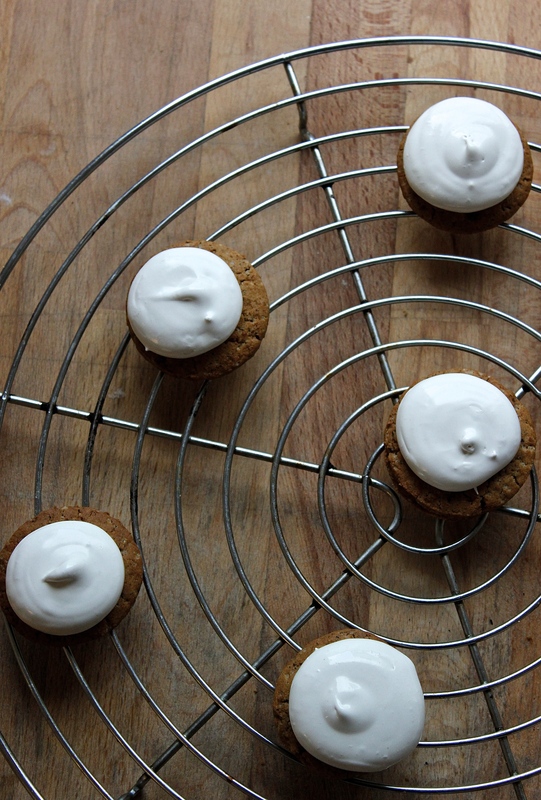 I think these buckwheat graham crackers will definitely make an appearance in my kitchen again!